Half-caff. You coffee drinkers know the term. It’s not quite the “real” thing but still your favorite drink, with enough kick to enjoy. It’s something you switch to for reasons of age or health… your best effort to live a long life on your own terms. I’m an avid coffee drinker myself. In fact, coffee is 50% of my evidence that God is good. Chocolate is the other share! (Chickens never made the list.) In any case, I’m the one who dubbed us Half-Caff Country. Some introductions are in order. I’m Zoë… a soon-to-be-sixty widow, mom and grandma. I was born and raised in Chicago, but had the gift of farm family in southern Indiana. By the age of four I had an unnamed—but very much felt—connection to the land. Later I set a life goal of marrying an Indiana dairy farmer (he turned out to be from Michigan and he’s long-since deceased, but that’s a different story). When the weather is nice I still miss the cows, but now that the snow is flying I’m content to listen to my neighbor’s beef cattle. The other human character in this adventure is Ruth, a former nun—born and raised in town—who brags about being much younger than I am. Well, it is nine months, after all! The only livestock Ruth ever owned was a cat named Korky, and I’m not sure it ever set foot outdoors. But despite that void, Ruth, too, feels very connected to the land. The rest of our family consists of a year-old, over-grown pound-puppy named Elle who doesn’t know she’s a dog, a half dozen ceramic fish in a full-sized fish tank, and our newly-arrived rooster, Little Buck, and his girls. A year ago Ruth and I made a leap of faith, pooled our resources (a.k.a. credit scores), and purchased an old farmhouse in rural Michigan. We’d love to be a traditional, completely self-sufficient homestead, but our more realistic hope is to grow old in our flannel shirts and work boots, living gently on the land… with a mortgage, of course. Now, keep in mind that my experience is with dairy cows. I know about milking, breeding, helping deliver calves, even doing CPR on them if they’re not breathing at birth. With chickens, I knew nothing. All I had was questions. How many breeds are there? Do we want pretty or practical? Brown eggs or Easter eggs? 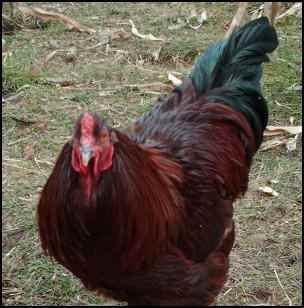 I knew the name of only one breed—Rhode Island Reds—and I prefer brown eggs. And neither Ruth nor I even knew for sure if we needed a rooster in order to get those eggs. You should have heard the comparative anatomy conversation that question prompted! The comedy had begun. Since there’s nothing in our area that even compares to a good, old-fashioned feed mill/farm store, we sought advice from the modern homesteader’s best friend… the Internet. First was the breed question. I stumbled across Henderson’s Breed Chart that listed many breeds with straightforward comparisons, including information about size, coloring, temperament, laying tendencies, winter-hardiness, etc. Two breeds stood out: Buff Orpingtons and Buckeyes. We needed winter-hardy birds that were adaptable to some version of free-range conditions. Also, the grandma and teacher in me wanted gentle animals that would seem more like pets than livestock. And it probably didn’t hurt that both breeds showed up on the first page of an extensive alphabetical list. After narrowing down our choices, we had to find out what was available in our area for a price that we could afford. Two sites were particularly helpful in that regard: www.localharvest.org and www.BestFarmBuys.com, both of which allow you to put in your zip code and find resources in “your neck of the woods.” We found some of each of our top choices and began the e-mail photo exchange and negotiations. Buckeyes, from the Local Harvest listing for Wind Racer Farm, won out. We jumped in our little pickup truck, armed with the dog carrier and total confidence, to go get our new brood… herd… flock… what do you call a group of chickens?! If you’re not familiar with them, Buckeyes are a rare heritage breed of dual-purpose chickens. They are relatively large, have pea combs, and are very winter hardy (we’ll be able to verify that next spring). The color is described as nut brown or mahogany, depending on what you read. 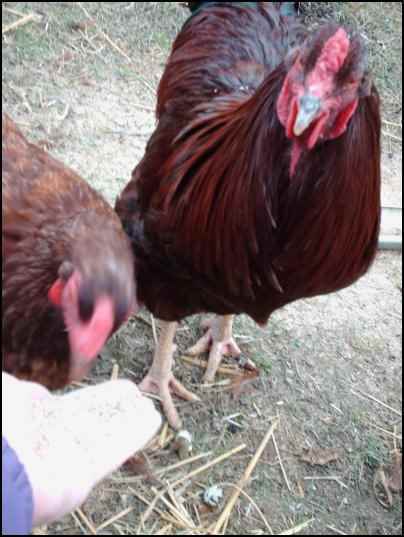 They remind me of Rhode Island Reds… but you already realize how little I know. The fact that they were developed by a woman and have fairly easy dispositions outweighed our natural Michiganian resistance to anything originating in the state of Ohio. We bought three hens and a rooster—a family unit—from some folks who are clearly more experienced homesteaders than we are. Violet and her husband started producing their own grass-fed pork and chickens out of concern for the food their children were eating. The kids not only eat well but also are also very involved with the animals and chores. They called our new rooster Little Buck, and we quickly christened the flock “Little Buck and the Buxoms.” Maybe if the egg thing doesn’t work out, we could train them as a singing group. Notice, we still haven’t addressed the issue of no barn/no fence for our impending free-range brood. “Not to worry… we can build a moveable chicken house,” I quipped in response to Ruth’s growing concerns. “How hard can that be, right?” We outlined our plans on the way home, while wondering why the chickens were riding with their mouths open but not making any noise. We later learned that’s how chickens deal with heat! Temporary housing was to consist of the Igloo-style doghouse that Elle has never used anyway and a tarp over a portion of the equally unused but “very secure” dog run. Of course, the run was only secure if we could get the chickens in there in the first place. We carefully moved the dog carrier from the back of the truck to the front yard where the run is located. Unbeknownst to anyone, the back end of the carrier wasn’t completely latched. So when we placed it down and opened the door, instead of the chickens gently finding their way to the feed and water waiting for them in the dog run, they scurried out the back and around the yard into the lilac bushes. The ensuing scene looked like Green Acres Does Keystone Cops… multiple laps around the run, flailing of arms, a serious breakdown of communication and on-the-job training on how to catch and hold a chicken. All we needed was the background music. By the time we got done, we were laughing so hard we couldn’t stand up. Fortunately, Buckeyes—ours, at least—really are fairly docile, and we got them into the run without serious insult or injury to them or us. Day One of our chicken farming was complete. The agenda for Day Two centered on building the moveable coop. Keep in mind, we’ve only been on our place for a year, so we didn’t even have all the tools that we needed for the job. And we always have more ambition than expendable income, so we went bargain hunting. At a second-hand store in town, we found a great power saw. It serves a dual purpose: cutting lumber and cutting out Ruth’s whining, “If I only had a saw.” Then we went to our favorite retired farmer/collector and bought a roost, as well as some vinyl house shutters and an old kitchen cabinet door to make the sides of our coop. In another second-hand store, we found four wheels so we could “easily” move our coop around the property. Finally, we went out behind the lumberyard and picked up free pallets for the floor and framing. The only new items we purchased were a box of screws and three pieces of PVC… and more of the steel posts and fence wire that we had used to rabbit-proof our garden. By the time we got home to start construction, it was time to gather eggs… two of them, current investment about $200 a piece. But it was all very exciting. Because the pallets were too small to hold the roost, we had to revise our rather amorphous plan. We pulled the pallets apart, used two large packing braces for the bottom, and then screwed boards across them to form the floor of the coop. The coop measures approximately 5’ by 4’ in floor area. The corner braces also gave us a solid surface to attach the wheels, so we didn’t have to worry about tires and an axle. Next came the sides. One end of the coop is taken up with the roost. It has four boxes and a shelf below. 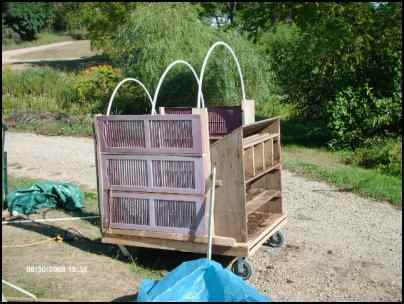 We attached upright braces to hold it in place, and built two doors on the back to allow for gathering eggs and cleaning. 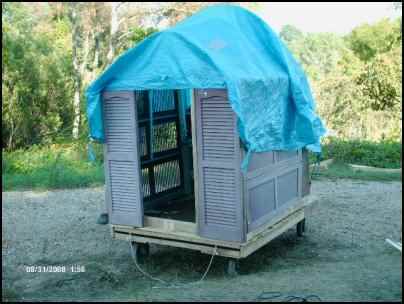 The other three sides of the coop are made up of the shutters, which offer some protection from wind and rain while allowing adequate ventilation in hot weather. Finally, we used the cabinet door to make the door for the coop. It is not attached, but rather held in place by bungee cords (oops, add bungee cords to our shopping list). 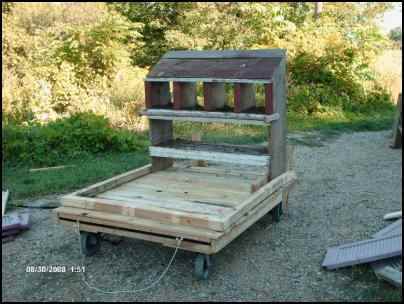 During the daytime, the door is lowered to become the ramp for the chickens to get in and out of the coop. The roof of the coop is shaped by curved PVC, and covered with a tarp. Continuing the spirit of second-hand, the tarp was cut from a holey, old screen house given to us by a friend. We used the solid plastic for the roof, and saved the screened part for later to help cover the run… keeping the chickens in and predatory birds out. It was Day Three before construction was complete, but we were feeling pretty proud of ourselves as we got ready to move our coop into place. Other than a bruised shin from a flying hammer, things had gone well and we were anxious to turn our flock loose in the new digs. Yet another adventure in the making. I’m no wimp, and Ruth is much stronger than I am, but when we got ready for the move, we felt like a couple of pack mules pulling a covered wagon. It turns out that our property is even hillier than we realized, the coop was heavier than planned, and we probably should have gone for tires and an axle. The coop is now called the Chicken Wagon, and it moves much less than originally envisioned. The only upside of the added weight is that we really are comfortable that the birds are secure at night. In any case, we parked the wagon next to our garden fence and enclosed an area for the chickens to run. Total free range isn’t an option for our flock because the neighbor’s two dogs have their own version of free range and run, and it could get ugly. We collected another day’s worth of those expensive eggs and congratulated ourselves on a job well done. Since both Ruth and I have jobs in town, our homesteading is interrupted by hours of absence. After returning one summer evening early on in our chicken business, we went out to check the garden, feed the birds, and gather eggs. As all good farmers do, we counted the flock… not much of a job in our case. We were short one hen. There was no sign of trouble (I’m resisting the temptation to say foul/fowl play), but there was a spot in the overhead netting that had come loose. So we started hunting. I went down the hill to the road, to make sure the hen wasn’t about to get hit by a car, and Ruth walked the top of the hill. Soon we heard the hen, followed the sound, and located her in the tall grass. The location, of course, kept moving. Chicken catching, Take Two. With our vast experience, the process went much more quickly this time. Very soon the hen was in, the netting was secured, and we brought the dog out in the yard with us. Elle quickly found what looked to us like a dinosaur egg lying on the hill. Well, maybe an ostrich egg. OK, so it was just a two-yolker, but remember we’re new at this. Later, the dog found two more eggs in the same area. We still haven’t figured out the math on that one! The first real chicken emergency occurred a few weeks later. Since the farm where we got Little Buck and the Buxoms had their dogs penned right beside the chicken runs, as extra protection, we thought nothing of having Elle with us one day while we were cleaning the garden. Little Buck was watchful but not alarmed. Elle was curious but not problematic. And the hens were just doing their thing. Ruth and I went on to do ours, just enjoying our Peaceable Kingdom as we pulled out dead plants and closed the beds for the season. Suddenly, total chaos broke loose. Elle had pushed through the fence to the chickens. Little Buck acted exactly as you would expect a rooster to act. He drew Elle’s attention to him so the hens could get into their coop. Once again, a chicken chase was on, only this time it was a matter of life and death. At one point in the running and yelling and arm flailing, Elle got Buck’s neck in her mouth. Fortunately, she let go of him long enough for Ruth to grab her and for Buck to escape to another area of the garden. The dog had a “come to Jesus” meeting with Ruth, the rooster had a few days of canine-induced laryngitis, and we were all faced with the reality that chicken-raising may not be all that easy after all. It is still, however, exciting. Since that crisis moment, life is back to our version of normal. We’ve moved the Chicken Wagon to its winter location, closer to the house and the compost pile. We’ve wrapped the sides in heavy plastic, added a black metal roof (lined with bubble wrap insulation) to absorb sunlight, and are playing with some ideas to add solar lights and alternate “heat” for the long Michigan winter. Little Buck and the Buxoms are back to normal, too. They follow me around when I’m out in the yard, come to the gate to meet me, and eat out of my hand with regularity. The other day, when I bent over to pick up eggs, Buck even decided to jump up on my back and use me for his ramp to get outdoors… and then stood and waited for me to give him some food. His personality is only exceeded by his appetite. Despite the comedy of errors, everyone is healthy and happy. The eggs are less expensive than they were at first, the flannel shirts are warm, and the boots are comfy. We may not be 100% homestead, but for us this is the real thing. And Half-Caff Country feels pretty darn good!